Synopsis: Based on the hit novel by John Green, about a teenage girl named Hazel (Woodley), suffering from terminal lung cancer, who finds a kindred spirit and first love in another cancer fighter, the outgoing and unconventional Augustus Waters (Elgort). Together they make the most of the limited and precious time they know they have left together. Sarah: Hello readers! 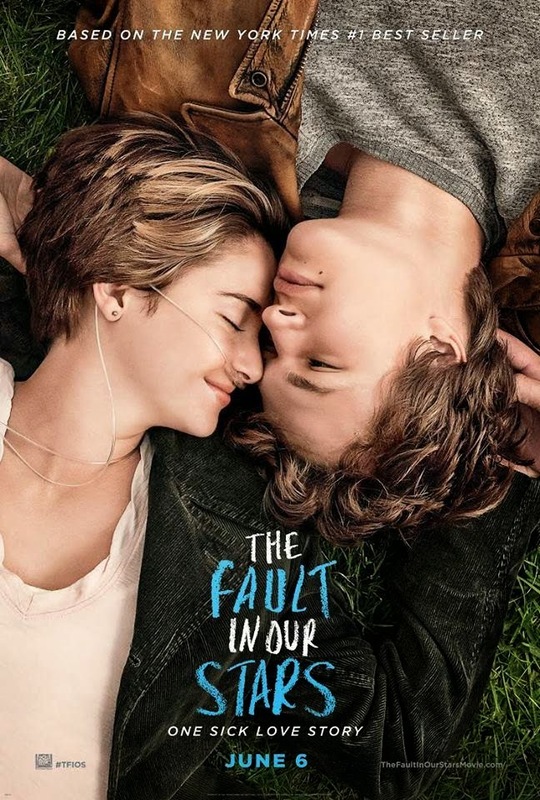 This past Friday night we decided to hit the movies to check out the newest book-to-chick flick to hit the big screen, The Fault in Our Stars, starring Shailene Woodley (The Descendents) and relative Hollywood newbie Ansel Elgort (Divergent). We neglected to remember that it was a Friday night…in the summer. So the theater was PACKED with teenage girls. This movie has been touted as being The Notebook of this decade. These are bold words, so we had to find out for ourselves. That, and this also happens to be based on my younger sister's favorite book. So Andrew, now that we've seen it and have lost about half our body weight in tears, what did you think? A: Let me first say that I was surprised by the number of men that were in the theatre. It was one of the smaller theatres at our cineplex and was PACKED to the gills. But as we left I counted at least six other guys that were in there. More than I would've have guessed, really. So as one of the at least seven guys that saw the movie in that theatre last night, I have to admit that I was a big fan of it. Did I shed a few tears? Absolutely, and it wasn't necessarily because of the star-crossed relationship between Woodley's Hazel Green Lancaster and Elgort's Augustus Waters, but because I found ALL of the relationships in the film to be quite touching in their portrayal and how the actors handled them. Most of all I thought Woodley was phenomenal here and deserves to be in the discussion come Oscar time. What did you think of The Fault in Our Stars? S: So here's the thing. I found it fairly predictable. I mean that in that I knew what was going to happen. You don't have a movie about cancer patients and not lose someone by the end of it. And yet, I still cried like a little baby. Did I love it? No. But it was a sweet little movie and I definitely agree with your opinion of Woodley in this movie. She has proven once again that, despite terrible beginnings on ABC Family shows, she is an Oscar force to be reckoned with. This movie cut straight to the core of the audience. And you're right, it wasn't just the love story. Actually, it was the relationship with Woodley's Hazel Grace and her parents, played by Laura Dern and Sam Trammell, thatt really set me off. They play parents that are trying each and every day to be as normal as possible while living with the fact that their daughter is slowly dying right before their eyes. Just heartbreaking. And they do a really good job at all of that! When it came to the love story, I have to admit, it took me a little while to get into it. Elgort was not instantly captivating for me. He is good looking, sure, but in a baby-faced kind of way. I don't know it just wasn't as believable as I had thought it might be. What I thought made it believable was Woodley's side of the relationship. She's what made it believable. A: Hazel's relationship with her parents was definitely the one that hit me the hardest. The basic idea that, as parents, your child is slowly dying right before your eyes and there's basically nothing you can do about it? That's heartbreaking to me. The idea of your kid dying before you do as a parent, alone, is a tough one and this film did a great job portraying that aspect. I'm assuming the book did a good job on the page, too. As for the relationship between Woodley's Hazel and Elgort's Gus, I thought it was very cute at first and as it goes along the actors themselves do a great job of portraying two teenagers - both of whom know that they don't have much time to be together - falling in love in the truest sense. To them it wasn't ALL puppy love but instead a deeper understanding that you need to spend the time you have with the ones you love, and it helps to have made a strong connection like they have. I liked that aspect. So when the characters' sicknesses ramp up in the third act, it's not wholly inorganic. And I say that because I can see why a number of critics of this film have been saying how manipulative it is. But isn't art - and especially a film - inherently manipulative? They're supposed to make us feel some sort of emotion, and that happens by manipulation regardless of whether it's overt or not. S: Well that's a great way to lead up to my next point. Why do all of these big romance movies have to be so freaking tragic? I get that it was a book and all, but all of the big romances in the last 20 years have been such downers. Someone usually dies at the end and leaves the audience just a little dehydrated. It's exhausting! But I guess I do feel a little manipulated and you're right, that is the point of a lot of films. They want you to leave a theater with a certain feeling and The Fault in Our Stars was no different. In fact, the whole audience pretty much felt the same way about this movie. I have never heard so much sniffing in one theater! A: To be fair it hasn't just been the last 20 years of films that have been ending tragically. Movies like Love Story and West Side Story did the same thing (and to be fair, West Side Story is essentially an adaptation of Romeo and Juliet). But I see your point. And here's my brief thought on this, and I'll make it brief only because I might want to post a longer piece about this. When you said you had never heard so much sniffling in one theatre, you're not exaggerating. Damn near EVERYONE in that theatre last night was crying and sniffling during the third act. So much so that at some point people just started laughing at all the sniffling to break the tension in the room. And isn't that what's so great about movies? And specifically about seeing a movie in a packed theatre with like-minded people? The catharsis of getting a good cry from this film, and then not having to be embarrassed about crying in public because another 200 people in the same room are all doing the same thing, is WHY the movie-going experience is so great. And The Fault in Our Stars is by far one of the best films for that kind of movie-going experience we've ever been to. S: I have to say, I really loved that for once I wasn't going to leave the theater feeling totally self-conscious about how I looked, because everyone was going to look like a hot mess. It really was an interesting phenomenon. Going into it I knew this movie would rip my heart out. And it did. But there were layers to that ripping. There was the obvious dying sadness, but there was also the disappointment and heartbreak that you witness with these characters. This is a fair time to give a small SPOILER ALERT if you haven't read the book or seen the movie yet. Hazel and Gus are super into this book about, you guessed it, cancer. The author has never written anything else but has invited them to visit him in Amsterdam to discuss it. Or so they think. Enter the surprise actor in this film, Willem Dafoe (The Grand Budapest Hotel). I had absolutely no idea that he was in this movie, and man am I glad that I didn't because I would have been set-up for possibly the meanest monologue that I have ever experienced in the movies. A: Dafoe was certainly a pleasant surprise here. His author, Peter Van Houten, is a drunk and a humongous jerk to Hazel and Gus. And their reaction to seeing what their literary hero is truly like is one of the more heartbreaking moments in the film. Dafoe was great, and Woodley and Elgort were great in the scene, too. It very easily could've been a laughable scene and it wasn't. S: But then they kiss. And it's supposed to be this huge moment for the two main characters, but we're talking like full on make-out session. And am I the only one who thinks making-out in the Anne Frank house it totally inappropriate?! Because it totally was. Just, ridiculous on every level. They lost me for a little bit there. And once again, I totally understand that it's supposed to be this big moment for Hazel, making it up all those stairs and then finally getting to kiss her man, but couldn't you wait until you were back on the streets? It just all seemed a little forced to me. END OF SPOILER ALERT. But that was really my only huge complaint. It just kind of rubbed me the wrong way. This movie was everything it promised to be in the trailer; sweet, romantic and extremely sad. But to be fair, it has been a while since a movie has reduced its audience to a puddle, so that was kind of fun. A: It was a very solid romantic film. It had its moments of levity and it dealt with the specter of death in a very real way that I appreciated. The whole last act of the film could've been horribly mishandled but it wasn't. It was actually probably the strongest part of the whole film, helped by the deft build up to it. I'm glad we went and saw it, and I can totally see why your sister loves this book now. FINAL VERDICT: A great date-night movie to see in theatres!